Patti on Believe in Magic! C.J. Penn on Believe in Magic! 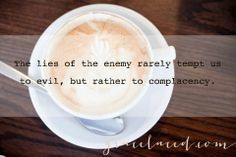 The lies of the enemy rarely tempt us to evil, but rather to complacency. Who is this enemy? Our disease. Pain, worry, anger, & fear… these are all emotions we may recognize as dangerous, slippery slopes along the path of our recovery. But what many of us ignore, myself included at times, is complacency. This was the topic of my women’s meeting tonight. In all of my self-searching, I have discovered that complacency has been my biggest problem. Attending meetings, being social in sober circles, reading meditation books, etc… these are not enough to keep me sober. I had been walking around with my Big Book covered in my fancy leather binder, notes in the margins, neatly kept. I had read that book, cover to cover. I had ‘worked’ the steps THREE times… but was I ever really working them? The mere fact that I do not know what it really means to work the steps means that I have a great deal of work to do. People talk about the fourth step as having been pivotal in their recovery. I agree, but the truth is that I think the third step is where the transformation begins. Yes, step 1… I am powerless… YES. Step 2, came to believe… AMEN. But Step 3, made a decision to turn our will and our lives over… You have got to be kidding! I wanted to be in control. I believed that being strong and having the desire would be enough. I had never trusted another person with anything of importance. I’m a self-admitted control freak. If I can’t trust others with simple daily tasks, how in the world can I turn my will and life over to a God that I do not fully understand? But I simply had to… at all costs. I need to do step 3 daily, sometimes more when I am having a bad day (i.e. trying to control everything.,..lol). Whenever I try to wrest my self from Him, then I lose out. Big time. It may not be a big thing, but in the end I have to remember that trying to run the show brought me to a very bad place. When I made that decision and followed through by working the steps and also working them in my daily affairs, things “magically” turned around. Funny how that works, eh? I don’t want to be that actor trying to direct the play any more. Even if my ego does. So I just hit the marks my Director leaves for me and leave the outcome to Him. Much simpler that way, isn’t it?